Jose Quintana and Willson Contreras meet on the mound during the second inning. The Atlanta Braves already filed the game away as a win. Most of the Chicago Cubs fans did, too. 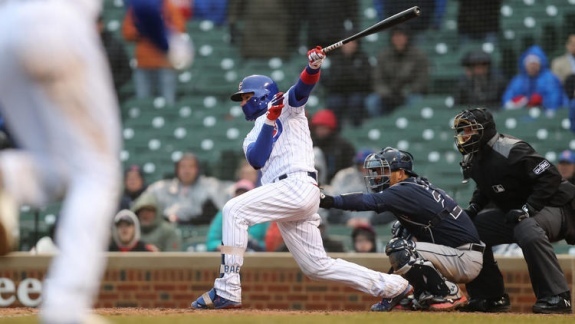 On a damp and blustery afternoon at Wrigley Field, the Braves held a 10-2 lead over the Cubs until the bottom of the sixth inning. With the score knotted 1-1 after the first inning, the Braves posted a three-spot in the second, a five-spot in the third, and an extra single run in the fourth for good measure. By the eighth inning, Wrigley Field was nearly deserted. Then the Cubs started to rally. Since the Braves are only visiting Wrigley Field once this season (April 13-15), the umpires planned to do everything in their power to complete this three-game series. 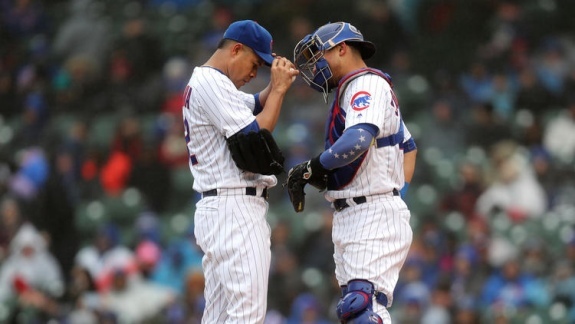 After falling to the Braves on Friday, 4-0, the Cubs hoped to even the series this afternoon. Last Sunday, Cubs starting pitcher Jose Quintana was masterful against the Milwaukee Brewers at Miller Park. He allowed just three hits over six scoreless innings to conclude the Cubs' nine-game road trip. Today, he failed to survive the third. He managed just 2 1/3 innings while surrendering seven hits and seven earned runs. Following Quintana's departure, reliever Eddie Butler allowed three more runs (only two earned). But after the fourth inning, the Cubs bullpen hung zeroes on the scoreboard. In the bottom of the sixth, the Cubs started to chisel away at the Braves' lead. Kyle Schwarber walked with the bases loaded scoring Ben Zobrist to make the score 10-3. They added two more in the seventh inning when Kris Bryant scored on a Zobrist triple, and then Javier Baez plated Zobrist on a ground out to the shortstop. After seven innings, the Braves still held a commanding 10-5 lead. Javy Baez doubles and drives home three runs during the bottom of the eighth inning. With the aid of only three hits, the Cubs plated nine runs in the bottom of the eighth inning. Willson Contreras singled and scored Jason Heyward, and then Zobrist walked to score Tommy La Stella. The Braves clung to a three-run lead, 10-7. With the bases loaded, Baez doubled to clear the bases scoring Bryant, Contreras and Zobrist. After falling eight runs behind, the Cubs rallied to tie the game, 10-10. Schwarber walked to score Baez, and La Stella walked to score Addison Russell. Then a wild pitch scored two more. With Efren Navarro at the plate, Braves reliever Peter Moylan threw a wild pitch that allowed Heyward and Schwarber to score. Heading into the ninth inning, the Cubs erased an eight-run deficit and grabbed a four-run lead. As the rain and wind picked up, Cubs closer Brandon Morrow entered the game in a non-save situation. Ozzie Albies walked to leadoff the inning, but Morrow made quick work of Dansby Swanson (strikeout looking), Freddie Freeman (ground out to first), and Kurt Suzuki (line out to right field). Final score: Cubs 14, Braves 10.